Beer fans love 22-ounce "bombers," but craft brewers' bottom lines love them more. BOULDER, Colo. (MainStreet) -- Craft-beer lovers may get their Coors- (TAP - Get Report) or Bud (BUD-swilling friends to try a Samuel Adams (SAM - Get Report) every so often, but luring them from 30 packs for $10 to 22-ounce bottles for $9 may be another story. Craft-beer fans are all too familiar with the 22-ounce, 650-mililiter brown bottles commonly known as "bombers." Just slightly smaller than the 750-milliliter bottles used for wine and certain Belgian beers, the bomber is often seen by brewers, distributors and sellers as a low-volume, low-cost gateway to customers unfamiliar with the brewery or beer style. Much as draft cans and bottles draw in Guinness ( DEO - Get Report) drinkers and stubby-necked bottles have been used to rekindle interest in Red Hook ( HOOK beers, the bomber prods craft-beer drinkers or newcomers to take a sip. "It seems that a 22-ounce as a matter of trial is less of a commitment to a new beer or brewery for the drinker than, say, a six-pack of 12-ounce bottles or cans," says Paul Gatza, director of the Boulder, Colo.-based Brewers Association craft-beer trade group. "I have been at many social occasions where several different 22-ounce bottles are served of various styles from craft brewers to accompany various phases of the evening or meal." Joseph Tucker, editor of beer-ranking site RateBeer, says the bomber was born out of necessity during a time a brewery couldn't put out a $7 sixer unless it was producing about 30,000 barrels a year. That's a mark even now-mainstay craft brewers such as Stone, Lagunitas and Dogfish Head were struggling to meet as recently as 2005. That made it tough for small brewers to compete when selling six-packs against more established breweries. "So younger brands like Stone took to the less crowded space of the bomber format -- a place mostly occupied by import brands in comparable metric sizes," Tucker says. "This allowed them to sell at price points that would tide them over until they could compete in the six-pack format." 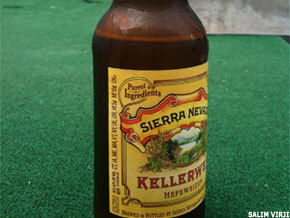 Chico, Calif.-based Sierra Nevada has been going with big bottles for the past eight years, using 24-ounce and 750-milliliter bottles instead of the bombers. Even as one of the largest craft brewers in the U.S., with 786,000 barrels of production last year, Sierra Nevada uses its big bottles to expand its presence on the shelves and in markets including New York, where Sierra Nevada spokesman Bill Manley says buyers have shown a preference for the big bottles. "The bigger bottles were initially intended to get placements in different outlets that didn't have the space nor the inclination to carry higher-end six-pack packages," Manley says, referring to such venues as convenience stores and smaller shops. "Since the release, however, we've found that many stores simply prefer the variety -- we often get requests from grocery outlets and chains to stock both our six-pack product and our 24-ounce bottles." The bomber has a low buy-in price for the beer novice, but that doesn't always mean it's a great deal. The Portland, Ore.-based blog It's Pub Night went bomber shopping last year and discovered that, by ounce of beer, the unit price of 22-ounce bottles carried a penalty for shoppers who picked them over six packs. A $3.39 22-ounce bottle of Anchor Steam, for example, would cost $11.09 as a six-pack given its per-ounce price, but an actual six-pack went for $9.29, putting the bomber at a $1.80 premium. Matt Simpson, owner of The Beer Sommelier and TheBeerExpert.com, says that premium is just the bitter aftertaste of supply and demand. "The fact is, counterintuitively, these big bottles command greater prices, per unit volume, than identical or similar beers in smaller vessels," Simpson says. "As long as people are willing to pay these higher prices, the breweries will continue marking up their profit percentages." That small upfront price and big markup is working. The Symphony IRI market research group says that "craft single 22-ounce glass" sales are up 34.4% during the first six months of 2011 from the same period last year. That's creating a healthy buzz within the entire craft-beer industry, which saw overall sales climb 14% by volume and 15% in dollar value during the first six months of the year. That's after an 11% jump in volume and 12% revenue increase last year that took craft beer from a 9 million-barrel, $7 billion industry in 2009 to a 10 million-barrel, $7.6 billion beast last year. But why are beer drinkers willing to pay a premium for a larger bottle and smaller sampling size? Simpson says the answer lies in human perception, buying habits and raw psychology. "The average craft-beer drinker is not only a very social animal -- who typically loves to share his beverage of choice with friends and family -- but doesn't typically compare prices when searching for 'the next big thing,'" Simpson says. "They typically sample whatever beers are on their radar -- no matter the vessel size." Free-spending craft-beer lovers make it tempting to bring in the bombers, but sometimes the big bottle just isn't the best fit for a brewer. When Lakewood, N.Y.,-based Southern Tier Brewing launched in 2002, it shipped some of its beers in six packs and 22-ounce bottles until the market told it otherwise. "We experimented with putting out regular IPA into 22-ounce bottles when we first started doing that in 2004 or 2005 and we were kind of competing with ourselves on that one," Southern Tier spokesman Nathan Aranone says. "We were taking some thunder away from the six packs, so we decided to switch to only imperial beers in the big bottles." When it comes to high-ABV beers, bombers aren't just a small-volume selling gimmick but a big help to brewers trying to move a big beer. Unlike standard, lower-alcohol beers, high-potency brews require lots of ingredients and lots of time. Southern Tier's Pumpking imperial pumpkin ale, for example, has 8.6% alcohol by volume and takes 16 to 18 days to ferment. While production of the beer has grown between 50% and 80% each year since its introduction in 2007, it's still brewed in a relatively small batch of 4,000 barrels. Southern Tier puts 19 imperial-style beers in 22-ounce bottles and shelves its 10 remaining beers in six packs. Given the $8 to $9 cost of Pumpking and imperial flavors such as Java, Chokolat and Creme Brulee, those beers would average out to $26 to $29 per six-pack at the price Southern Tier fetches per fluid ounce. "If we were trying to do those all in six packs, we'd be looking at a really expensive six pack," Arnone says. "Also, the shelf space of the 22-ounce bottle means you can get three brands in the same space as a six pack." At Shipyard Brewing in Portland, Maine, which began brewing 9% ABV Smashed Pumpkin imperial pumpkin ale and releasing it in 22-ounce bottles last year, founder and brew master Alan Pugsley plans an entire Pugsley Signature Series line of big beers that even includes a barley wine. The not-so-hidden secret about high-alcohol bomber beers such as Smashed Pumpkin, which Pugsley likens to a port, is that they're looking to compete less with the Schlitz in the six-pack cooler and more with the sherry in the wine section. "That's really meant to be shared at the dinner table or wherever as opposed to a bottle of wine," Pugsley says of the high-ABV 22-ouncers, "and you see a lot of people sharing a bottle of fairly high-alcohol beer and replacing the wine." An $11, 750-milliliter bottle of Sierra Nevada and Dogfish Head collaboration beer Life and Limb may seem exorbitant compared with a $9 six-pack of either brewery's IPA, but put the 10.2% ABV maple-flavored brew up against an $18, 750-milliliter bottle of wine such as Lagrima Vinho do Porto and the booze-soaked after-dinner playing field looks a bit more favorable. "Boutique brands, like Hill Farmstead, Evil Twin and Stillwater Artisanal, and bigger breweries like Sierra are coming in now and pricing at $7 to $30 at the bomber or similar size -- like 750 milliliter -- and getting what they're asking," RateBeer's Tucker says. "The converted wine enthusiast is still getting happy about these prices -- these world-class luxuries are quite affordable." Jason Notte is a reporter for TheStreet. His writing has appeared in The New York Times, The Huffington Post, Esquire.com, Time Out New York, the Boston Herald, the Boston Phoenix, the Metro newspaper and the Colorado Springs Independent. He previously served as the political and global affairs editor for Metro U.S., layout editor for Boston Now, assistant news editor for the Herald News of West Paterson, N.J., editor of Go Out! Magazine in Hoboken, N.J., and copy editor and lifestyle editor at the Jersey Journal in Jersey City, N.J.